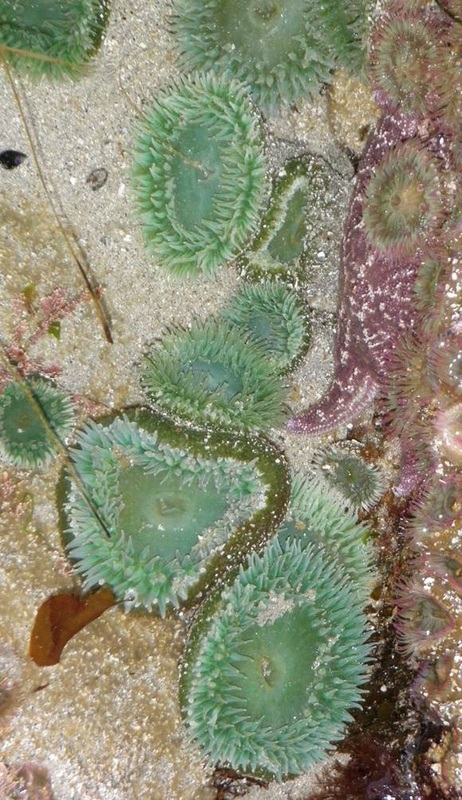 Left: Giant green anemones in a tidepool, next to a colony of aggregate green anemones (at right of image, with pink tips). Photos by Wiebe Nijland (top left), Caylie Boos (bottom left), Francine Beaujot (top right), and Jenn Burt (bottom right). This anemone can grow to 30 cm in diameter and 30 cm tall. Its column is olive green and has a bumpy texture due to tubercles covering most its surface. These tubercles are sticky, so bits of shell, rock, and sand may be stuck to the column. The oral disc and tentacles can vary from bright green to a light, bright blue or greyish-blue. The tentacles, which are short and cone-shaped, can also be white. While this species is often solitary, it can also be found in large numbers. It prefers to not be closely packed together, though in instances with limited space and resources it will resort to crowding. 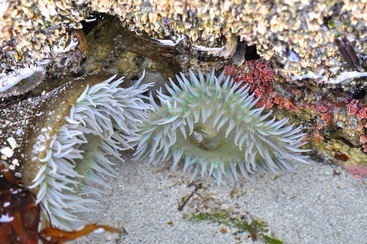 The aggregate green anemone is similar to the giant green anemone, except that it has distinct purple-tipped tentacles. 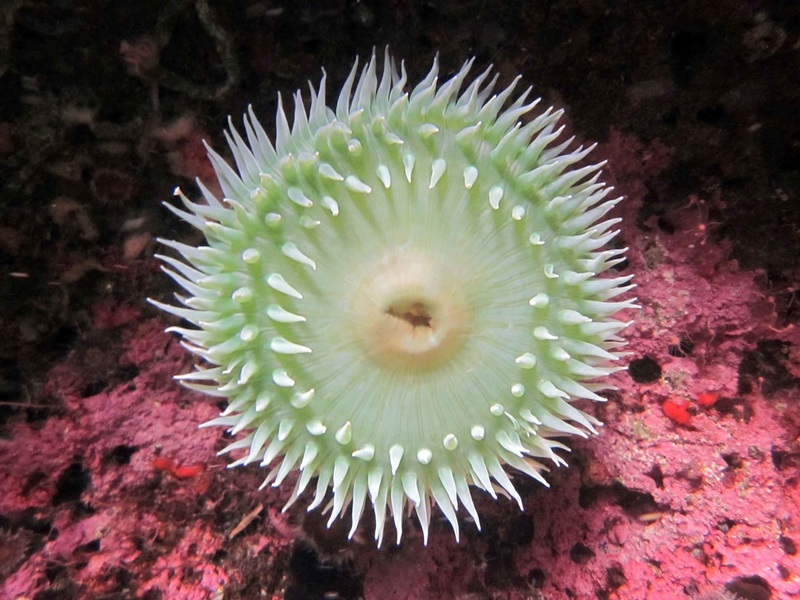 It will also form a colony of tightly-packed clones over all available surface, whereas the green sea anemone prefers to be solitary, or at least not crowded. This species hosts symbiotic algae in its tissues, but unlike some plant-algae symbioses, the giant green anemone does not derive its green colour from the algae living within its tissues. It instead produces the green pigment itself. Both zoochlorellae (green alge) and zooxanthellae (dinoflagellates) are found in giant green anemone tissues. The algae gain protection from grazers, while anemones gains nutrients from the algae. 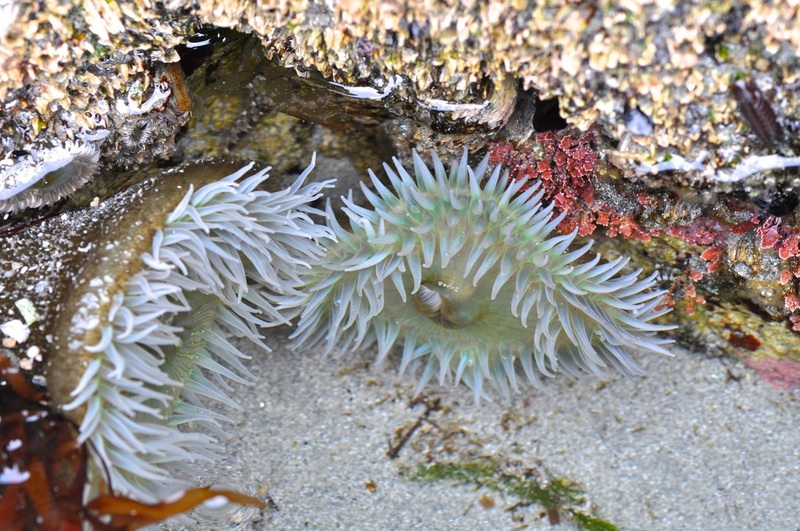 Anemones in shady locations may lack these symbiotic algae. 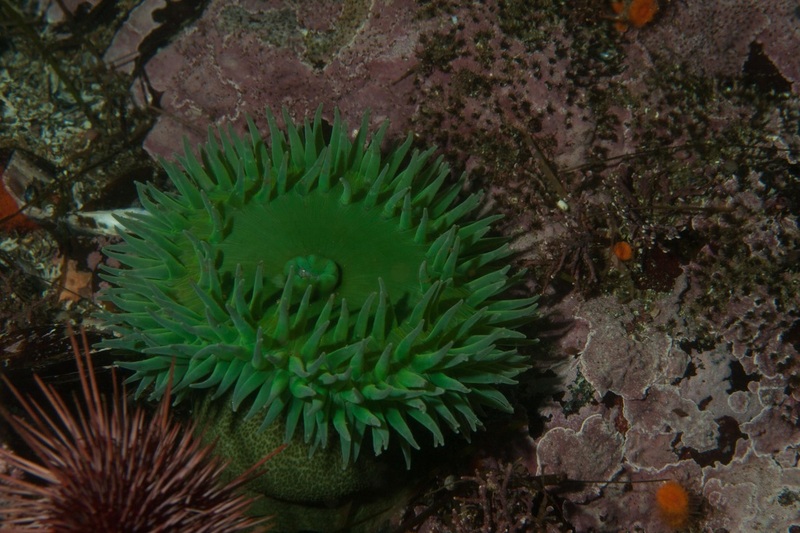 While the giant green anemone mostly eats small fish and invertebrates such as crabs and detached mussels, it is capable of consuming much larger meals. This species has been caught in the act of eating seabird nestlings on multiple occasions, though whether the birds were alive or dead when the anemones got ahold of them is unknown. Harbo, R. M. (1999). Whelks to whales: Coastal marine life of the Pacific Northweest. Madeira Park, BC: Harbour Publishing. P. 42. White, B., Helmstetler, H., and Cowles, D. Anthopleura xanthogrammica, Brandt (1835). Invertebrates of the Salish Sea. Rosario Beach Marine Laboratory. Accessed 11/01/2016. Chanda Brietzke, Kelly Fretwell, and Brian Starzomski (2016).